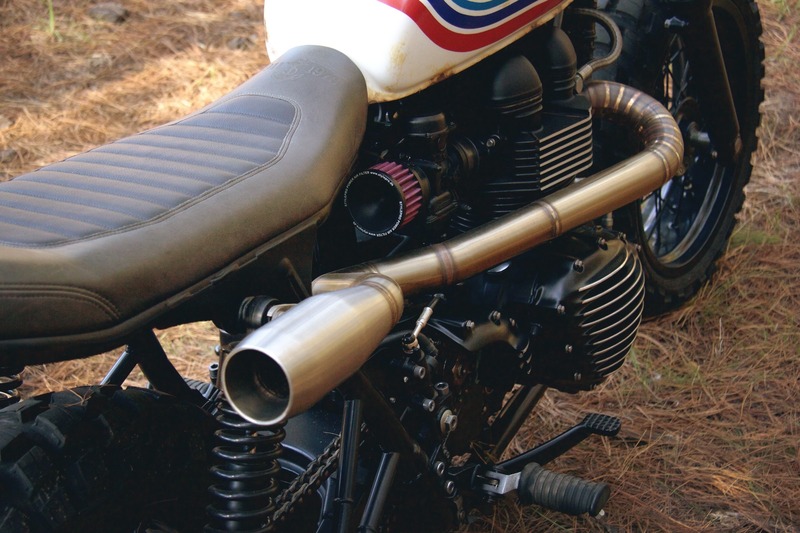 The most noticeable change between the Bonneville and the Scrambler is the addition of twin high exhaust pipes down the side – a common sight on classic scramblers from the 1950s and ’60s as it keeps them up away from the terrain, and has the added bonus of keeping them dry when crossing streams. This wasn’t the only change though, the Scrambler sounds notably different to the Bonneville as it’s fitted with a 270° crank rather than the 360° crank. 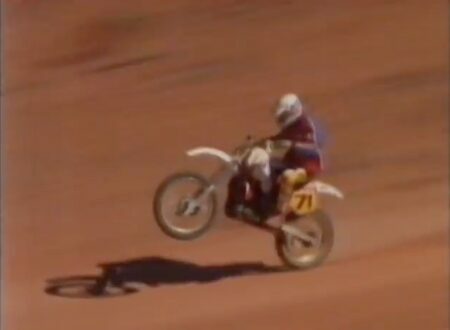 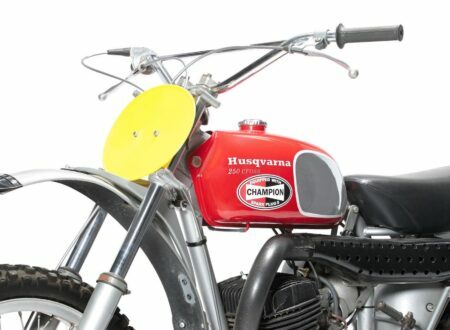 This helped shift torque down the rev range, giving more bottom end power at the expense of a little high end horsepower – however owners quickly realized they could get back this horsepower and gain quite a bit more with a simple series of carburetor and exhaust upgrades (often with an airbox delete). 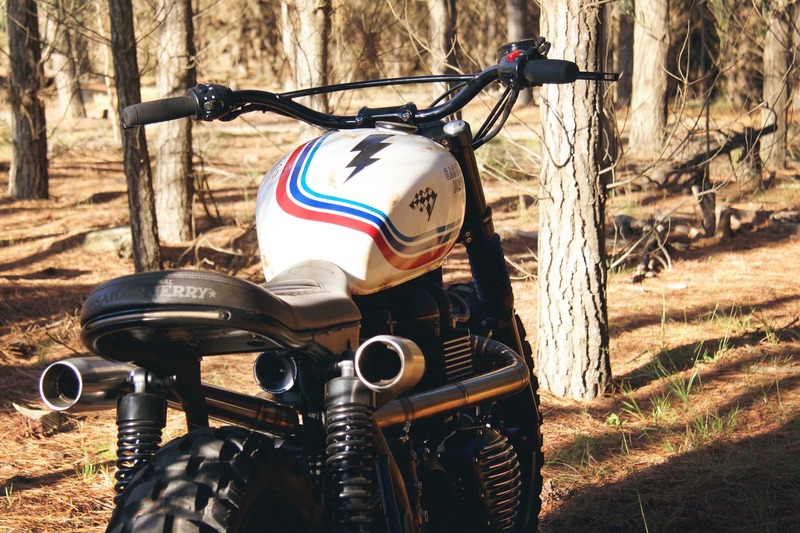 For 10 years after its release the Scrambler became one of the most popular platforms for custom bike building in the world – so much so that many bought Bonnevilles and turned them into Scramblers. 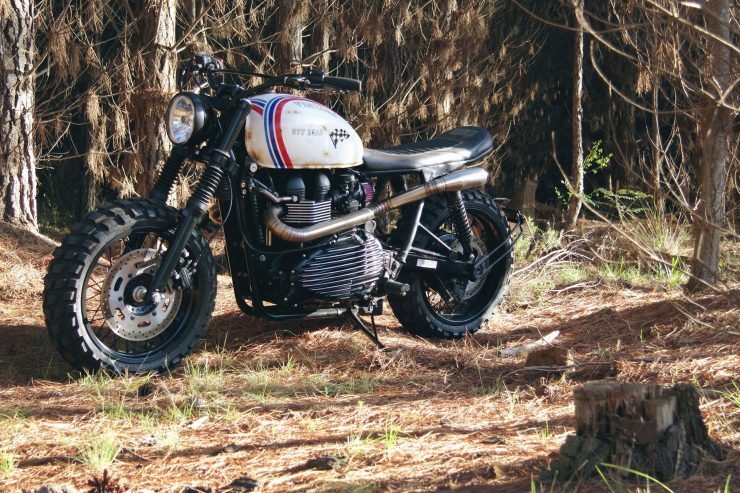 In the years since many of Triumph’s competitors have brought out their own scrambler models, and today the retro dual sport category is one of the most popular niches. 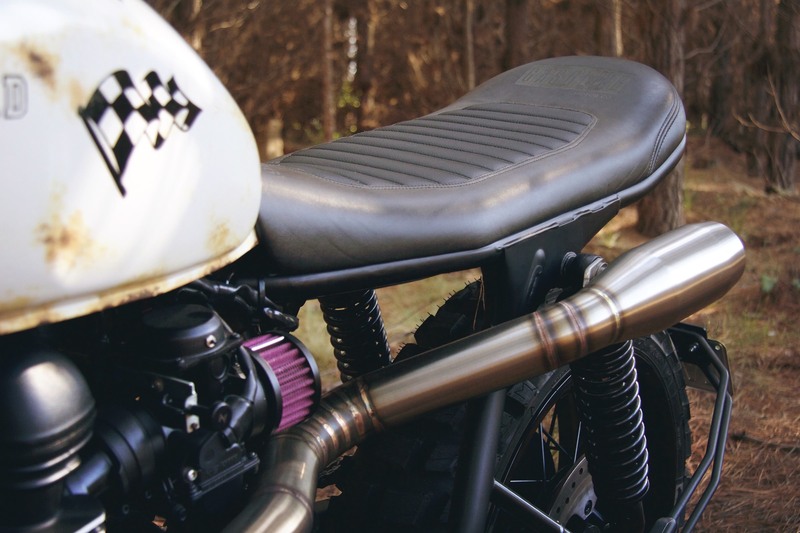 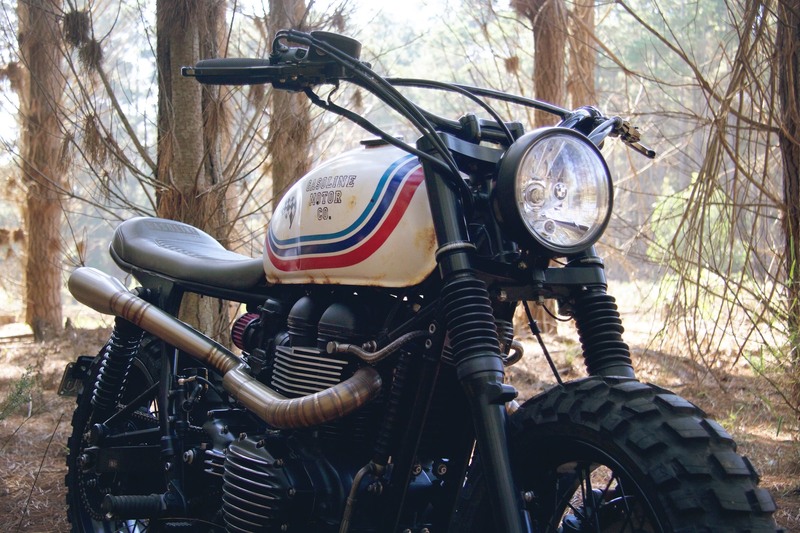 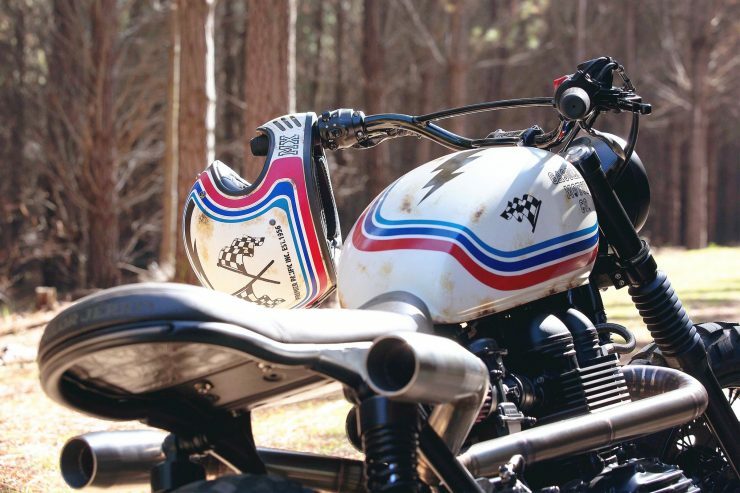 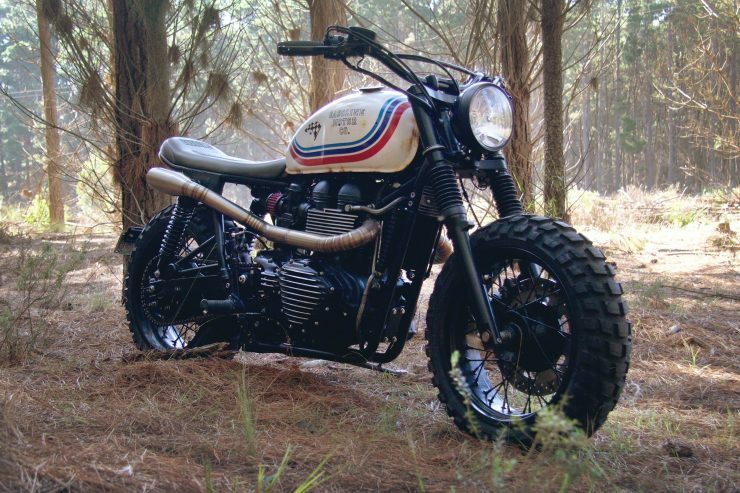 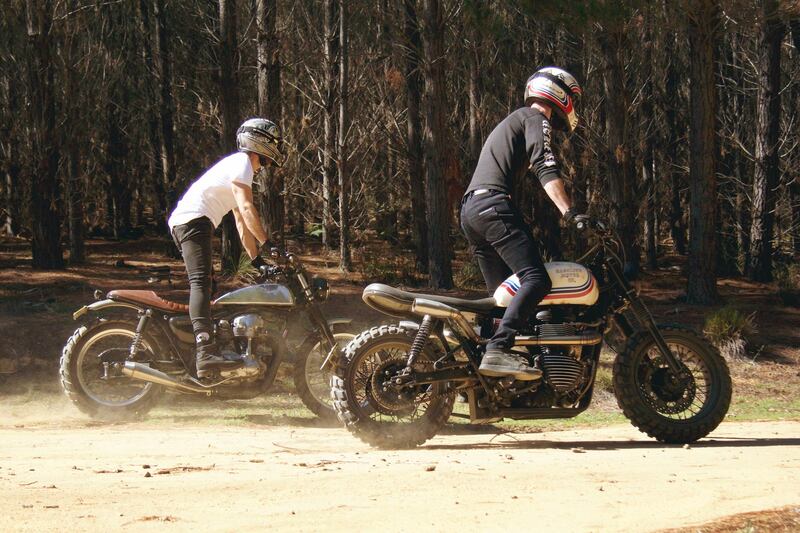 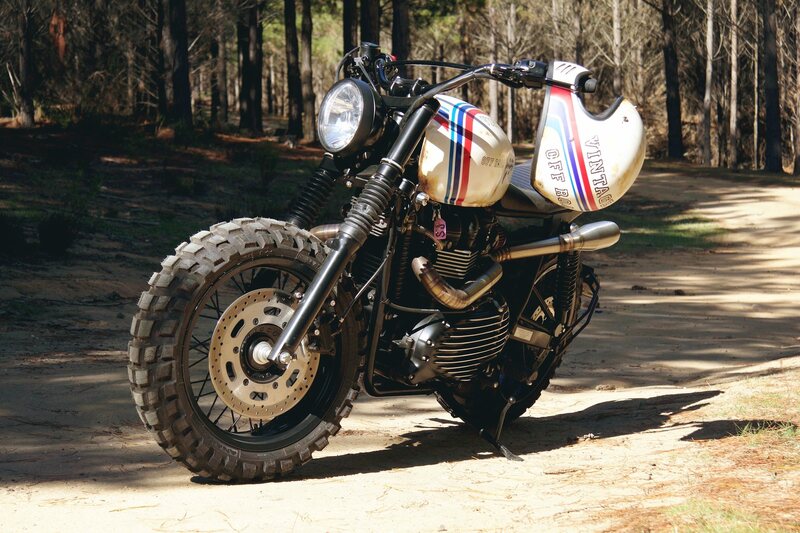 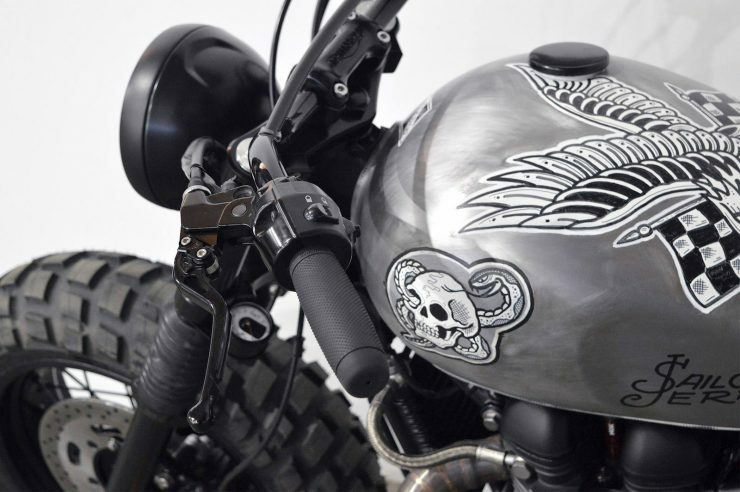 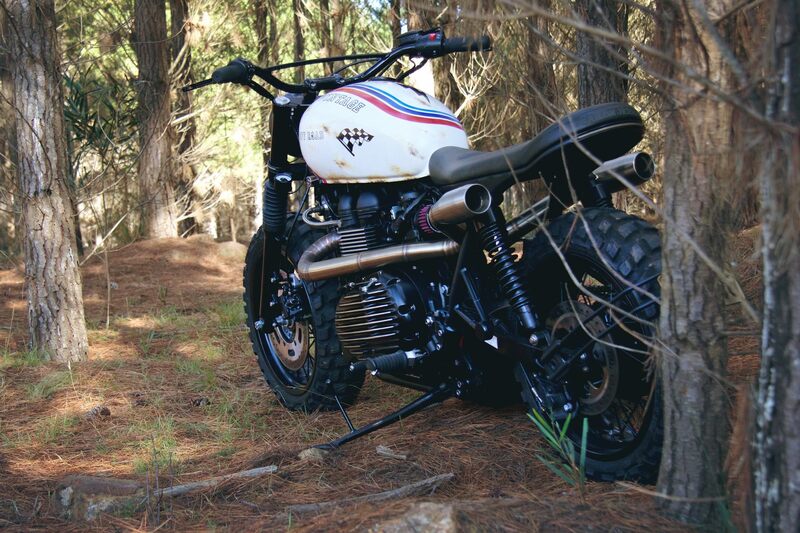 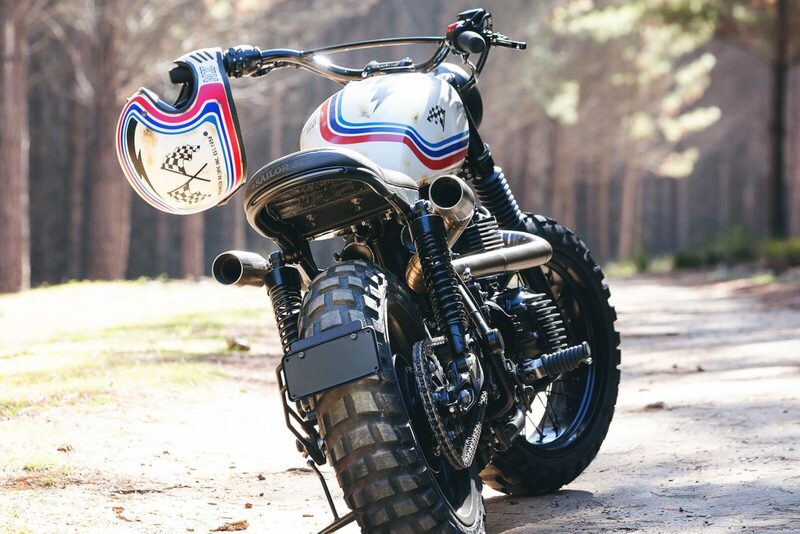 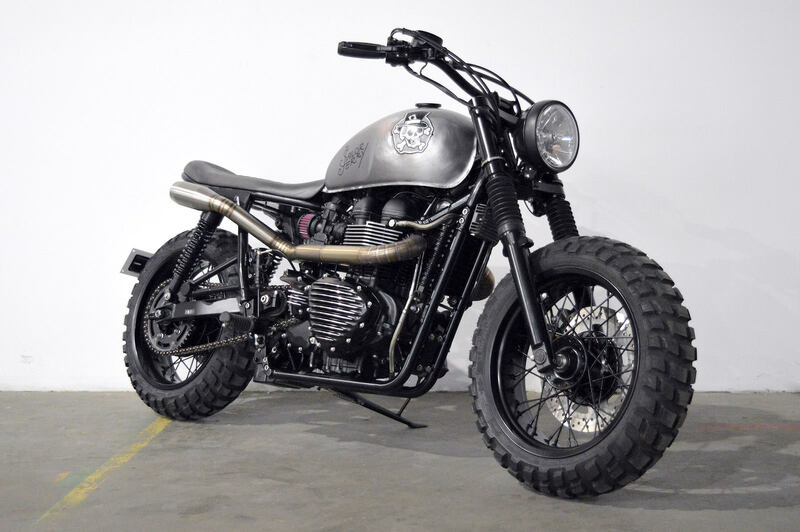 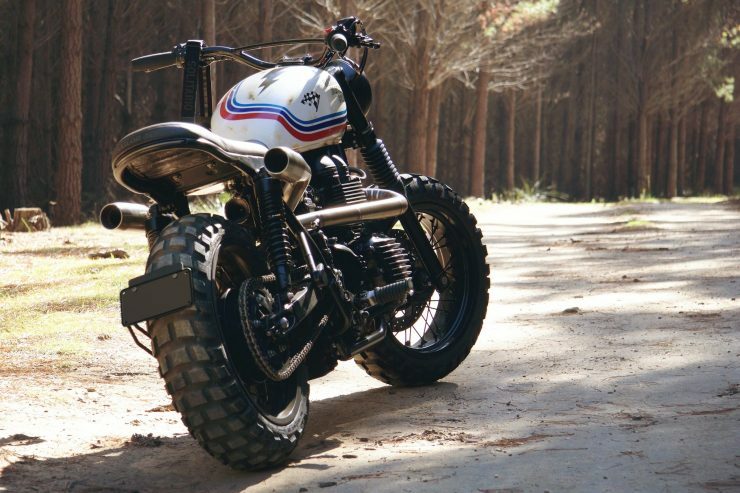 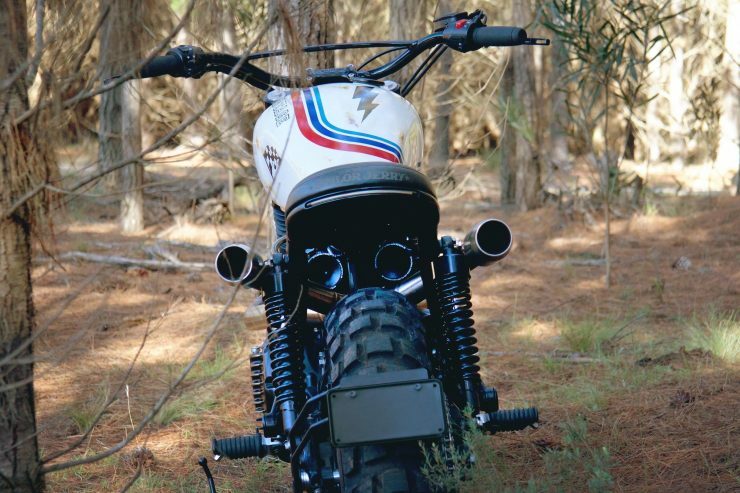 The Scrambler you see here actually started life as a factory-stock 2008 Triumph Bonneville, it was bought by Sydney-based custom motorcycle garage Gasoline Motor Co. as the base for a new build that had been commissioned by Sailor Jerry. 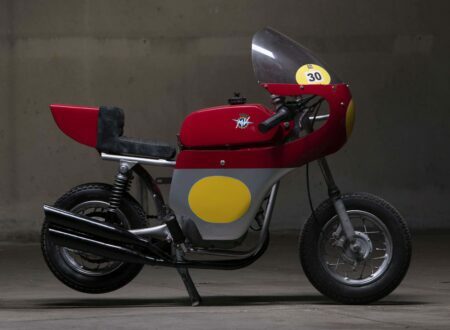 Once the bike had been wheeled into the garage and jacked up on the hydraulic lift the disassembly began – it was stripped back to a bare engine-in-frame with all the factory plastic removed. 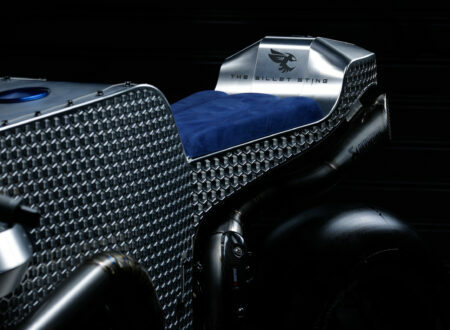 The subframe was modified for the new seat and an LED taillight was added (with built-in indicators). 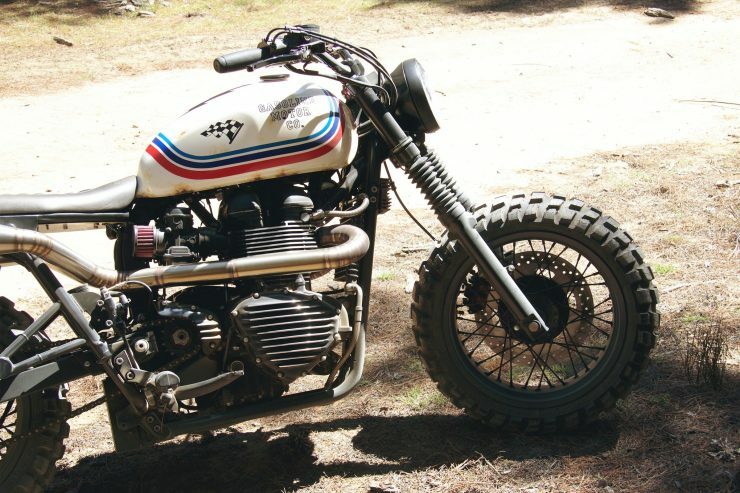 The wider rims were laced to the original hubs, before being fitted with new chunky off-road tires, and the stock fenders were tossed into the recycling pile. 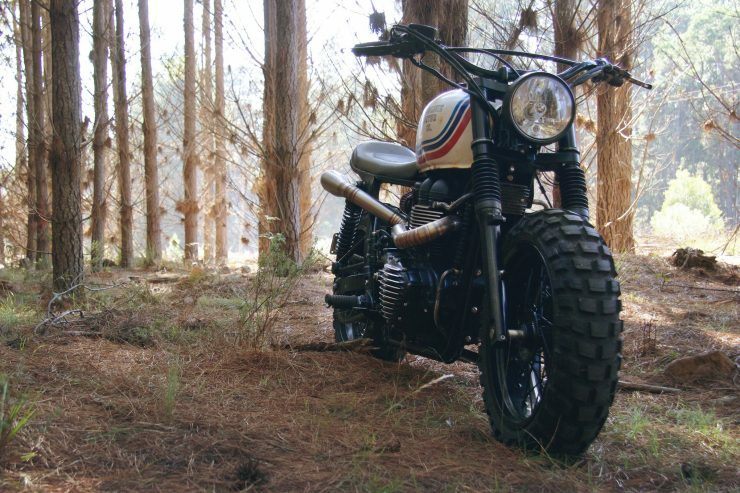 A new set of scrambler-height rear shocks were fitted to lift the tail a little and improve ground clearance over the stock road shocks. 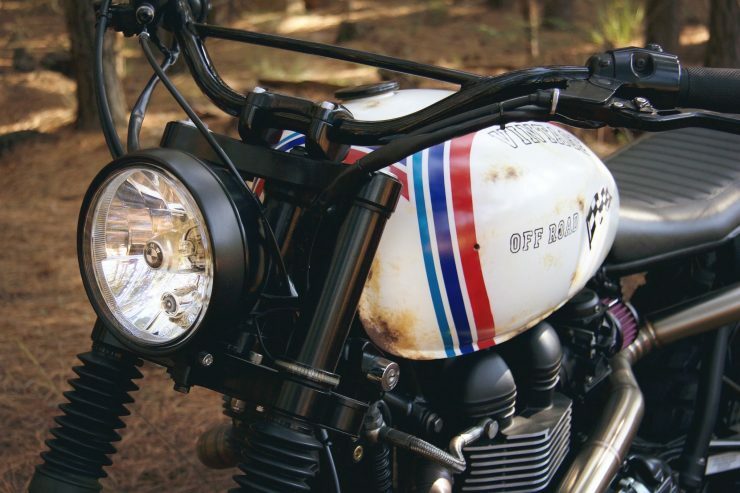 A new braced, off-road handlebar was added, along with twin high-performance exhausts, high-flow pod air filters, and a new lower profile headlight (from BMW). 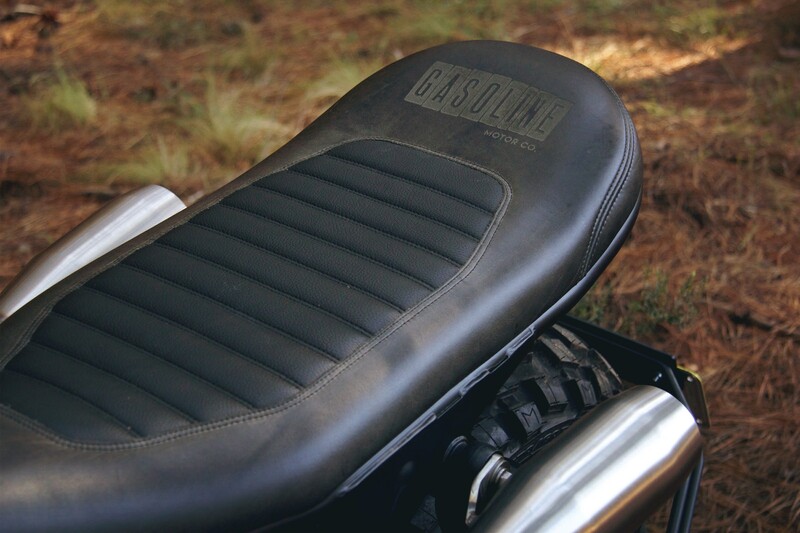 The clean midsection is thanks to an airbox delete and a hidden battery compartment to tidy the electrics tucked away out of eyesight. 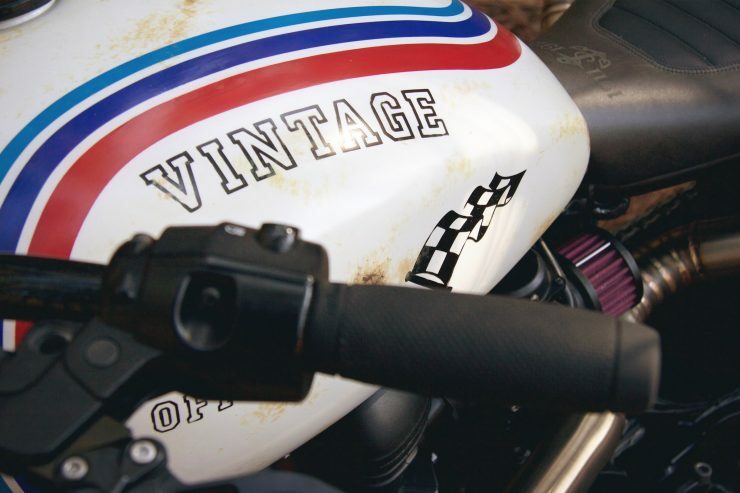 Once completed the bike was fitted with a tank by Retroline in Australia based on the racing stripes used on Premier motorcycle helmets. 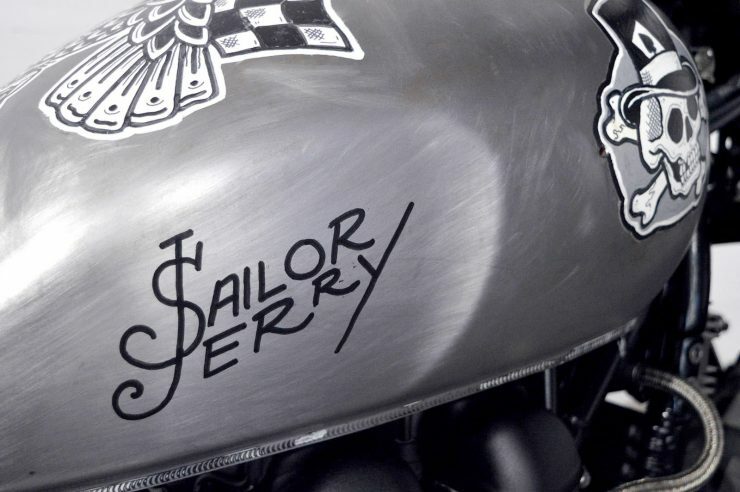 A second tank was created by highly-regarded tattoo artist Rhys Gordon, this will be the tank that is fitted to the bike during regular use (and you can see a few shots of it below). The completed bike is due to be given away as a prize by Sailor Jerry later this year, if you’d like to see more from Gasoline Motor Co. you can click here to visit their website.